Most nutritional disorders with deleterious effects on the central and peripheral nervous system are secondary to vitamin deficiencies, particularly those of the B group. Many of these disorders occur in the setting of malnutrition associated with alcoholism. A detailed discussion of all vitamin B deficiencies is beyond the scope of this article. However, four of the more common vitamin B deficiencies—thiamine (B1), cobalamin (B12), niacin (B3), and folate (B9)—are reviewed. Thiamine deficiency can also cause beriberi. Dry beriberi is a peripheral nervous system disorder associated with peripheral neuropathy. Wet beriberi is a cardiovascular disorder associated with cardiac manifestations and edema secondary to congestive heart failure. Infantile beriberi can occur in breastfed infants secondary to inadequate thiamine levels in the mother's breast milk. Niacin is a water-soluble vitamin and an essential component of nicotinamide adenine dinucleotide (NAD) and nicotinamide adenine dinucleotide phosphate (NADP), coenzymes required for oxidation-reduction reactions. Niacin can be found in the diet or can be synthesized during tryptophan metabolism. Niacin deficiency results in pellagra, a condition characterized by diarrhea, dermatitis, dementia and, eventually, death. Folate is a water-soluble essential vitamin found in green leafy vegetables and the liver. Folate is converted into THF, the active form involved in single-carbon transfers in a variety of metabolic reactions. THF is required for the conversion of homocysteine to methionine (which also requires cobalamine), the synthesis of thymine and purine bases, and the metabolism of serine and glycine. Folate deficiency is most commonly associated with megaloblastic anemia. Pregnant women with low folate intake have an increased risk of neural tube defects (NTDs); folic acid supplementation reduces the risk of NTDs. [11, 12] In rare cases, folate deficiency may be associated with subacute combined degeneration of the spinal cord. Cobalamin must bind to intrinsic factor, a glycoprotein produced by parietal cells in the stomach, before it is absorbed in the terminal ileum. Cobalamin deficiency can result from reduced production of intrinsic factor and/or cobalamin malabsorption. Impaired intrinsic factor production can result from pernicious anemia, gastrectomy, and bariatric surgery. [8, 24, 26] Malabsorption may be seen with ileal resection, Crohn disease, tuberculous ileitis, celiac disease, tropical sprue, as well as Helicobacter pylori gastritis. Cobalamin deficiency may also occur with pancreatic insufficiency; malnutrition; strict vegetarian and vegan diets; and congenital disorders of cobalamin absorption, transport, metabolism or utilization; and also with the use of various drugs including protein pump inhibitors and H2-receptor antagonists. [6, 8] Infants exclusively breastfed by vitamin B12-deficient mothers are also at risk for cobalamin deficiency. Wernicke encephalopathy and Korsakoff syndrome involve the bilateral mammillary bodies, medial hypothalamus, thalamus, periaqueductal gray matter, and the floor of the fourth ventricle. Dry beriberi affects the peripheral nervous system. Cobalamin deficiency results in a demyelinating disorder of the spinal cord. Niacin deficiency primarily affects neurons in the brainstem, cerebellar dentate nucleus, and spinal cord. Folate deficiency may also result in a demyelinating disorder of the spinal cord. Dry beriberi is characterized by a symmetric, predominantly distal, sensorimotor polyneuropathy with dysesthesias, reduced distal reflexes, and muscle weakness. Wet beriberi is a cardiovascular disorder with high-output cardiac failure, peripheral edema, pulmonary edema, and orthopnea. Folate deficiency is associated with elevated serum levels of homocysteine. Neurologic symptoms that occur with folate deficiency include cognitive impairment, dementia, and depression. In rare cases, subacute combined degeneration (SCD) of the spinal cord may occur. SCD due to folate deficiency clinically resembles the SCD associated with cobalamin deficiency. 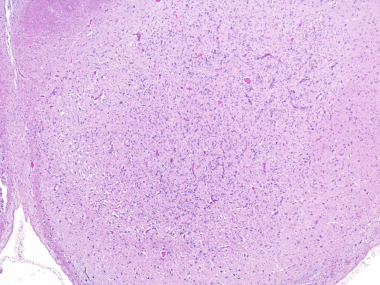 The acute phase of Wernicke encephalopathy shows bilateral, symmetric areas of softening, with petechial hemorrhages in the mammillary bodies, thalamus, medial hypothalamus, periaqueductal gray matter, floor of the fourth ventricle, and colliculi. In chronic Wernicke-Korsakoff syndrome, there is shrinkage and brown discoloration of the mammillary bodies accompanied by variable degrees of hydrocephalus. Cobalamin deficiency is characterized by atrophy and discoloration of the posterior columns (gracile fasciculi and cuneate fasciculi) and the lateral columns (the lateral corticospinal tracts more frequently than the lateral spinothalamic tracts) of the spinal cord. The brain and spinal cord are macroscopically normal in pellagra. Folate deficiency may associated with atrophy and discoloration of the posterior and lateral columns of the spinal cord. Early Wernicke encephalopathy. Note the prominent capillaries, microglial proliferation, and edema within the mammillary bodies (1 of 2). Early Wernicke encephalopathy, with prominent capillaries, microglial proliferation, and edema within the mammillary bodies (2 of 2). Subacute combined degeneration of the spinal cord with spongy vacuolization and demyelination in the gracile funiculi of the posterior columns (A: hematoxylin & eosin [H&E] stain; B: stained with luxol fast blue/periodic acid-Shiff [LFB/PAS] stain). Pellagra is characterized by chromatolysis of neurons in the pontine nuclei and cerebellar dentate nuclei. Betz cells of the motor cortex may be involved in case induced by use of isoniazid therapy. In severe cases, other brainstem nuclei and anterior motor neurons in the spinal cord may be affected. Histologic features of SCD of the spinal cord due to folate deficiency are identical to those in cobalamin deficiency–associated SCD. Based on neuropathologic findings, the main differential diagnosis for Wernicke-Korsakoff syndrome (WKS) is Leigh syndrome, a progressive neurometabolic disorder caused by mutations in mitochondria-related genes encoded by nuclear DNA or mitochondrial DNA. Leigh syndrome frequently presents in infancy, although pediatric and adult cases are reported. 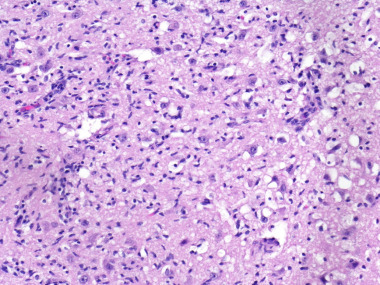 The topographic distribution and histology of central nervous system lesions in WKS and Leigh's disease are similar; however, mammillary bodies are typically spared in Leigh syndrome. Thomson AD, Guerrini I, Marshall EJ. The evolution and treatment of Korsakoff's syndrome: out of sight, out of mind?. Neuropsychol Rev. 2012 Jun. 22 (2):81-92. [Medline]. Restivo A, Carta MG, Farci AM, Saiu L, Gessa GL, Agabio R. Risk of thiamine deficiency and Wernicke's encephalopathy after gastrointestinal surgery for cancer. Support Care Cancer. 2016 Jan. 24 (1):77-82. [Medline]. Lonsdale D. Thiamin. Adv Food Nutr Res. 2018. 83:1-56. [Medline]. Zahr NM, Kaufman KL, Harper CG. Clinical and pathological features of alcohol-related brain damage. Nat Rev Neurol. 2011 May. 7 (5):284-94. [Medline]. Roman GC. Nutritional disorders in tropical neurology. Handb Clin Neurol. 2013. 114:381-404. [Medline]. Herrmann W, Obeid R. Cobalamin deficiency. Subcell Biochem. 2012. 56:301-22. [Medline]. Smith AD, Warren MJ, Refsum H. Vitamin B12. Adv Food Nutr Res. 2018. 83:215-79. [Medline]. Hunt A, Harrington D, Robinson S. Vitamin B12 deficiency. BMJ. 2014 Sep 4. 349:g5226. [Medline]. Kirkland JB, Meyer-Ficca ML. Niacin. Adv Food Nutr Res. 2018. 83:83-149. [Medline]. Naderi N, House JD. Recent developments in folate nutrition. Adv Food Nutr Res. 2018. 83:195-213. [Medline]. Crider KS, Bailey LB, Berry RJ. Folic acid food fortification-its history, effect, concerns, and future directions. Nutrients. 2011 Mar. 3 (3):370-84. [Medline]. Molloy AM, Pangilinan F, Brody LC. Genetic risk factors for folate-responsive neural tube defects. Annu Rev Nutr. 2017 Aug 21. 37:269-91. [Medline]. Lough ME. Wernicke's encephalopathy: expanding the diagnostic toolbox. Neuropsychol Rev. 2012 Jun. 22 (2):181-94. [Medline]. Kumar N. Nutrients and neurology. Continuum (Minneap Minn). 2017 Jun. 23 (3, Neurology of Systemic Disease):822-61. [Medline]. Kril JJ. Neuropathology of thiamine deficiency disorders. Metab Brain Dis. 1996 Mar. 11 (1):9-17. [Medline]. Park YK, Sempos CT, Barton CN, Vanderveen JE, Yetley EA. Effectiveness of food fortification in the United States: the case of pellagra. Am J Public Health. 2000 May. 90 (5):727-38. [Medline]. Oldham MA, Ivkovic A. Pellagrous encephalopathy presenting as alcohol withdrawal delirium: a case series and literature review. Addict Sci Clin Pract. 2012 Jul 6. 7:12. [Medline]. Ishii N, Nishihara Y. Pellagra among chronic alcoholics: clinical and pathological study of 20 necropsy cases. J Neurol Neurosurg Psychiatry. 1981 Mar. 44 (3):209-15. [Medline]. McLean E, de Benoist B, Allen LH. Review of the magnitude of folate and vitamin B12 deficiencies worldwide. Food Nutr Bull. 2008 Jun. 29 (2 suppl):S38-51. [Medline]. Odewole OA, Williamson RS, Zakai NA, et al. Near-elimination of folate-deficiency anemia by mandatory folic acid fortification in older US adults: Reasons for Geographic and Racial Differences in Stroke study 2003-2007. Am J Clin Nutr. 2013 Oct. 98 (4):1042-7. [Medline]. Singleton CK, Martin PR. Molecular mechanisms of thiamine utilization. Curr Mol Med. 2001 May. 1 (2):197-207. [Medline]. Butterworth RF, Kril JJ, Harper CG. Thiamine-dependent enzyme changes in the brains of alcoholics: relationship to the Wernicke-Korsakoff syndrome. Alcohol Clin Exp Res. 1993 Oct. 17 (5):1084-8. [Medline]. Lallas M, Desai J. Wernicke encephalopathy in children and adolescents. World J Pediatr. 2014 Nov. 10 (4):293-8. [Medline]. Becker DA, Balcer LJ, Galetta SL. The neurological complications of nutritional deficiency following bariatric surgery. J Obes. 2012. 2012:608534. [Medline]. Ortigoza-Escobar JD, Alfadhel M, Molero-Luis M, et al, for the Thiamine Deficiency Study Group. Thiamine deficiency in childhood with attention to genetic causes: Survival and outcome predictors. Ann Neurol. 2017 Sep. 82 (3):317-30. [Medline]. Smelt HJM, Pouwels S, Said M, Smulders JF. Neuropathy by folic acid supplementation in a patient with anaemia and an untreated cobalamin deficiency: a case report. Clin Obes. 2018 Aug. 8 (4):300-4. [Medline]. Logan C, Asadi H, Kok HK, et al. Neuroimaging of chronic alcohol misuse. J Med Imaging Radiat Oncol. 2017 Aug. 61 (4):435-40. [Medline]. Jung YC, Chanraud S, Sullivan EV. Neuroimaging of Wernicke's encephalopathy and Korsakoff's syndrome. Neuropsychol Rev. 2012 Jun. 22 (2):170-80. [Medline]. Misra UK, Kalita J, Das A. Vitamin B12 deficiency neurological syndromes: a clinical, MRI and electrodiagnostic study. Electromyogr Clin Neurophysiol. 2003 Jan-Feb. 43 (1):57-64. [Medline]. Kocaoglu C, Akin F, Caksen H, Boke SB, Arslan S, Aygun S. Cerebral atrophy in a vitamin B12-deficient infant of a vegetarian mother. J Health Popul Nutr. 2014 Jun. 32 (2):367-71. [Medline]. Akcaboy M, Malbora B, Zorlu P, Altınel E, Oguz MM, Senel S. Vitamin B12 deficiency in infants. Indian J Pediatr. 2015 Jul. 82 (7):619-24. [Medline]. Ekici F, Tekbas G, Hattapoglu S, Yaramıs A, Onder H, Bilici A. Brain MRI and MR spectroscopy findings in children with nutritional vitamin B12 deficiency. Clin Neuroradiol. 2016 Jun. 26 (2):215-20. [Medline]. Harding A, Halliday G, Caine D, Kril J. Degeneration of anterior thalamic nuclei differentiates alcoholics with amnesia. Brain. 2000 Jan. 123 (pt 1):141-54. [Medline]. Ellison D, Love S, Chimelli L, et al, eds. Neuropathology: A Reference Text of CNS Pathology. Edinburgh, UK: Mosby Elsevier; 2013. Ishii N, Nishihara Y. Pellagra encephalopathy among tuberculous patients: its relation to isoniazid therapy. J Neurol Neurosurg Psychiatry. 1985 Jul. 48 (7):628-34. [Medline]. Buizert A, Sharma R, Koppen H. When the laughing stops: subacute combined spinal cord degeneration caused by laughing gas use. J Addict Med. 2017 May/Jun. 11 (3):235-6. [Medline]. Thomson AD, Cook CC, Touquet R, Henry JA, for the Royal College of Physicians, London. The Royal College of Physicians report on alcohol: guidelines for managing Wernicke's encephalopathy in the accident and emergency department. Alcohol Alcohol. 2002 Nov-Dec. 37 (6):513-21. [Medline]. Javanainen M, Pekkarinen T, Mustonen H, Scheinin T, Leivonen M. Two-year nutrition data in terms of vitamin D, vitamin B12, and albumin after bariatric surgery and kong-term fracture data compared with conservatively treated obese patients: a retrospective cohort study. Obes Surg. 2018 Jun 23. [Medline]. Wang H, Li L, Qin LL, Song Y, Vidal-Alaball J, Liu TH. Oral vitamin B12 versus intramuscular vitamin B12 for vitamin B12 deficiency. Cochrane Database Syst Rev. 2018 Mar 15. 3:CD004655. [Medline].